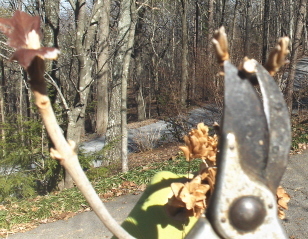 Deadheading and pruning hydrangeas in January – Johntheplantman's stories, musings, and gardening. 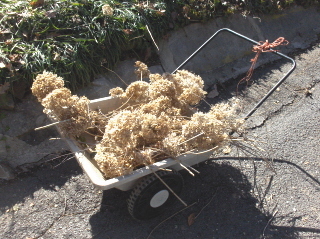 A rare beautiful January day found us preparing some new flower beds for Ms. Marion, who most people around here refer to as “The hydrangea lady.” I knew she was working in the yard and I really wasn’t paying attention to what she was doing until I walked by a garden cart full of old, brown hydrangea blooms that had been freshly cut. Since I get asked about cutting, deadheading, and shaping hydrangeas quite often, and since Marion is the most knowledgeable hydrangea grower I ever met, I went looking for her to see what was going on. I found her bent over a planting of hydrangeas, busily working her pruning shears. I asked about her technique because what she was doing was different from what I would have done. She stood and smiled and said, “These are ‘Annabelle’ hydrangeas. Annabelles and a few others of their kind (h.arborescens) bloom on new growth and may be pruned at any time.” She was quick to add that hydrangeas do not have to be pruned and that she was just taking off the old blooms and cutting to get a little shape on the plants when they come back in the spring. Marion does not believe in much actual “pruning” of the hydrangeas, but she said that it was time go remove the old blooms which were becoming unsightly. She said that a few other hydrangeas, notably “limelight” and “pee gee” hydrangeas bloom on new growth and are not so particular. Cut the hydrangea bloom righ above the new growth. So then I asked, “what would happen if you cut the plant lower because it was too tall?”To which she replied, “Well, I wouldn’t do that because I will get more blooms by cutting up high. If you want to shape the plant, or if it is just too tall, you can cut the stem as low as you wish with the understanding that the only blooms left will come from the already developed new growth. 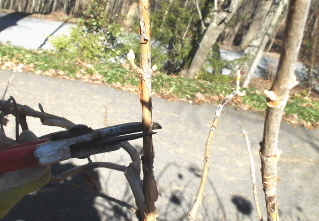 For instance, you can cut way down here (see picture below) and the plant will still bloom from the buds below. In a few short statements and by showing me a few examples, she had answered my question about cutting the old blooms from hydrangeas. The fact that she was doing the job on a day in January told me that this was the correct time to do so. Marion would not have been doing that particular job, otherwise. She is a most knowledgeable and accomplished teacher. 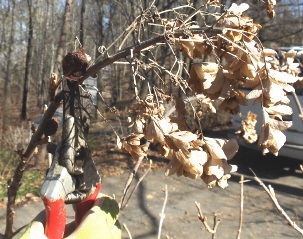 John, thank you very much for your very informative article on pruning hydrangeas. At the house where I lived before here in Sterling, Virginia, there was a huge hydrangea bush; I used to prune it to get rid of the old, dried blosoms. It seems to have done it good, because every year it would leap towards the sky. Also, in this yard was a peony tree. It amazed me every year with its magenta blooms the size of soft balls. The previous owner must have known alot about plants and shrubs ( or she knew a nursery owner really well…), because she had an amazing assortment of plants. For the three years I lived there, I took care them quite well. 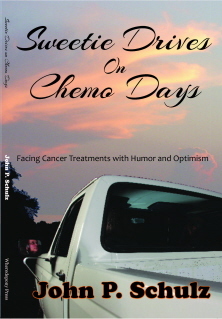 I also enjoyed reading your book “Requiem for a Redneck” very much. I hope you are doing well, and please know that ‘ I am gunning for you ‘, given the circumstances. Take care. Pingback: Late January or February—Time to Prune Boxwood and Liriope | Johntheplantman's stories, musings, and gardening.